According to the Network for Excellence in Health Innovation, in the United States, poor medication adherence alone accounts for $290 billion of the annual $750 billion in wasted healthcare spend. In addition, medication non-adherence with complex oral oncolytic regiments that patients take from home can lead to ineffective treatments, hospitalizations and unnecessary disease progression. Do your oncology patients often forget to take their medications? If so, and your patients are taking certain oral oncolytics for FDA approved indications, AdhereTech can help improve adherence and clinical outcomes. AdhereTech is a smart, wireless pill bottle equipped with lights and chimes that remind patients when it is time to take their medication. The system also makes automated phone calls to patients or caregivers if a dose is missed. Patient responses are sent to a live care team who can contact the individual in real time to ensure they are using the medication appropriately. 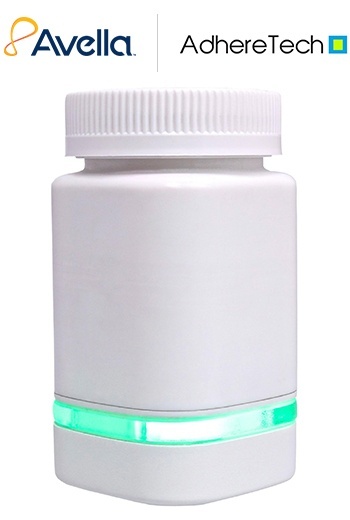 To provide additional insight on this technology with adherence, we conducted a clinical study on the effect of a "smart pill-bottle" on medication adherence in patients who have multiple myeloma and are new to lenalidomide therapy. The primary objective was to determine the difference in adherence rates between the intervention group and the control group. In the clinical study, the median adherence rate of lenalidomide patients was 100% adherence compared to 90.75% in the control group. In addition, we found that the incremental cost-effectiveness ratio estimated the cost per patient at $1,000, but it was $11,000 per year to gain one adherent patient, and an improved adherence rate of 9.25%. Learn more about AdhereTech for your patients to help drive patient adherence through this innovative tool. In addition, you can see the results of the recent Avella clinical study of patients using AdhereTech. 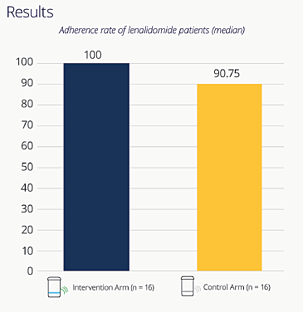 The study showed 9.25% improved adherence over the control patient group and greatly improved the patients' likelihood of taking their medication within the recommended time window. Access the case study.